Abbey first learned about giving when she was 4 years old and her church participated in the Angel Tree program at Christmas time. She had a hot chocolate stand to raise money to buy gifts. Some people, like Abbey, just understand the need to give back. 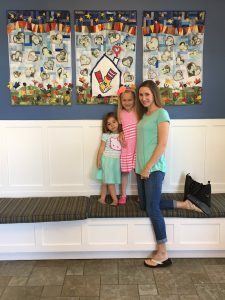 We are thankful that this now almost 6-year-old has decided to give back to Ronald McDonald House Charities of Alabama. Abbey’s mom took her two daughters (Abbey and her younger sister Jenna) to the Elevate the Stage gymnastics meet between Auburn and Alabama in January 2016. While at the meet, the girls stopped by the RMHCA booth to learn more. Each of the girls got a tattoo on their hand of the RMHCA logo – this sparked something inside of Abbey’s heart. There were several mentions of the Ronald McDonald House during the event and even a video on the big screen. When Abbey’s mom explained what RMHCA did, Abbey grew attached to the mission and wanted to learn more about the charity. She immediately wanted to help out the families served by the House. 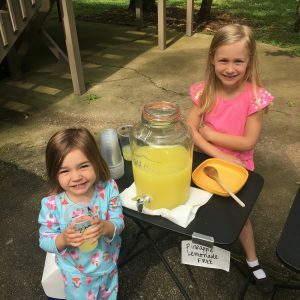 During the months following Elevate the Stage, Abbey raised $200 for RMHCA through a family yard sale and lemonade stand. The girls stopped by the House to learn more, tour the facility, and present the money they worked so hard to earn. Abbey will start school next year in her hometown of Gardendale where she is excited to collect pop tabs to help her school in our annual Pop Tab Pandemonium contest. This young girl already knows the importance of giving back at such a young age and we are lucky to be the one of the recipients of her giving heart! If you are interested in giving back to RMHCA, like Abbey, make sure to check out the many ways to get involved under “How Can You Help” on our website and sign up for our e-newsletter to get the latest information.